Below are the official 2017 Hockomock League Boys Swimming All Stars, selected by the coaches in the league. MILFORD, Mass. 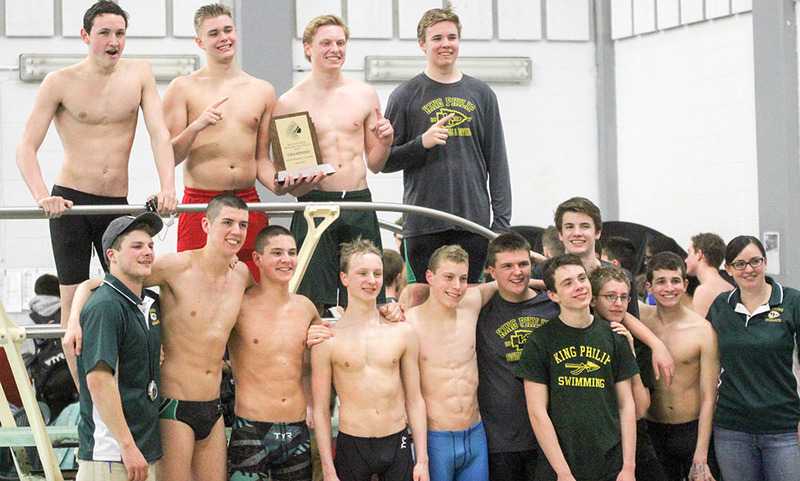 – The King Philip boys swimming team had to share the dual meet title with Franklin and Taunton. The Warriors weren’t going to share the Hockomock League Championship title with anyone. For the second straight year, King Philip took home first place at the league meet held at Milford High School, pulling away from Canton, Milford, Franklin and Taunton down the stretch. The Warriors had a total of 279 points. King Philip won the first event of the day (200 medley relay) and it turned out to be the only first place finish the Warriors. In the final 10 events, the Warriors relied on their depth with a swimming finishing in fourth or better in eight of them. The only two events KP didn’t have a placement in the top six were the 100 yard free and the 200 free relay. The team of sophomore Colby Vieira, senior Jack Poppenberger, senior Andy Sprague and sophomore Tyler Stringfellow got the Warriors off to a strong start, clocking in at 1:46.96 to win the 200 medley relay, edging Franklin, Milford and Franklin by a second or less. That foursome went on to pace King Philip the rest of the way. Vieira took fourth in the 200 IM (2:07.78) and third in the 100 backstroke (57.74), Poppenberger took third in the 100 breaststroke (1:07.04) and was apart of the 200 free relay that placed seventh, Sprague had a pair of third place finishes, first in the 50 free (23.35) and then in the 100 fly (55.12) and Stringfellow took second in both the 200 free (1:50.30) and 500 free (4:53.69). Sprague, Vieira and Stringfellow, along with Dean Whyte, took second in the 400 free relay (3:28.06) to finish the meet. KP also got strong performances from freshman John Dionis (eighth in the 200 free), Dean Whyte (eighth in 200 IM and fifth in the 100 backstroke) and Tate Duffy (fourth in 500 free and eighth in 100 breaststroke). All three were also apart of the 200 free relay that took seventh. “Dean Whyte came in with some really good placing, Andy Sprague and John Dionis picked up some big points, Kyle Loud helped out too,” Pettine said. “Pretty much everyone on the team, top to bottom, came through in the clutch and that was exciting. It was all-team effort which is great. Fresh off a Davenport division dual meet title, Canton carried its momentum in to grab second place with 256 points. The Bulldogs followed the lead of senior Sebastian Melendez (four time winner) and capitalized on strong showings in the freestyle events to get second place. Melendez took first in both the 200 free (1:45.54) and the 500 free (4:46.23) – touching the wall at least five seconds ahead of second place in both events. Melendez also anchored the 400 free relay to a thrilling comeback in the final event of the meet and was also apart of the 200 free relay that took first. Melendez was joined by seniors Owen Guerini and Sean Mitchell as well as freshman Adrian Bankowski in both relay wins. “Those were big points there are the end, that really elevated us at the end,” said Canton coach Cheryl Cavanaugh. “Our relays were awesome. All of the kids had personal bests, some of the kids were even knocking as much as five and six seconds off of their time. It was an incredible day for us. Diego Ferstler also record points for the Bulldogs, placing ninth in the 50 free, 11th in the 100 free and taking 10th in the 200 medley relay along with Chris Milne, Matthew Gilmore and Justin Diep. Mile also took 11th in the 100 breaststroke and Gilmore and Deep took sixth and 12th, respectively, in the 100 fly. Milford rounded out the top three, finishing with 251 points. Senior Nick Antonellis followed up an impressive performance at last year’s meet with another strong showing on Friday night. Antonellis claimed first place in both the 200 IM (1:59.15) and the 100 fly (53.96) and helped two relay teams to top five finishes. Antonellis teamed with Daniel Pacella, Chris Watson and Marcello Panno to clock in at 1:47.65 in the 200 medley relay – good enough for third place. That same foursome teamed together for the 400 free relay and finished in 3:35.26, taking fourth place. Watson surged to a first place finish in the 100 breaststroke. Panno also placed in the 50 free (sixth, 23.65) and the 100 free (fifth, 52.71). Scarlet Hawk freshman Gillieson Hobert took seven in the 100 backstroke (1:04.77) and 11th in the 50 free (25.25) and teamed with Pacella, Michael Khoury and Gianni Panno for a fourth place finish in the 200 free relay. Franklin senior Connor Bourgeois won the 50 free (22.51), Oliver Ames sophomore Kyle Gray touched first in a very close 100 free race, coming in at 51.20 – 0.02 seconds ahead of Sharon’s Jason Hertz. North Attleboro’s Nick Haddad claimed first in the 100 backstroke (55.09). King Philip’s Cara Angelo and Oliver Ames’ Cam Bourne won the diving championships at the beginning of the meet. Canton @ Stoughton – Postponed to 10/31 at 3:30. Foxboro @ North Attleboro – Postponed to 10/28 at 4:00. Franklin @ King Philip – Postponed to 10/28 at 3:30. Oliver Ames, 2 @ Mansfield, 0 – Final – Oliver Ames senior Thomas McCormick was in a giving mood on Thursday night, registering a pair of assists to pace the Tigers to a win on the road. McCormick set up junior Nathaniel Cardoza in the first half for the game-winning goal. Junior Matt Campbell added an insurance goal early in the second half off another assist from Cardoza. Sharon, 5 @ Milford, 2 – Final – Each team had a first half lead but the squads headed into halftime tied 2-2. Sharon went on to score three goals in the second half to come away with the two points. Andrew Reyes-Jones opened the scoring in the first minute to give Sharon the lead before Marcello Panno tied it on an assist from Pedro Sampaio. Sampaio put Milford ahead on an assist from Joey Madden but Shalin Patel tied the game off a corner kick from Michael Baur. In the second half, Ben Stamm scored two straight games, on assists from Jeffery Gao and Baur. Jake Teven capped the scoring on an assist from Spencer Hall. Milford head coach Brian Edwards said Nuno Mestre played well on defense. Stoughton @ Canton – Postponed to 10/31 at 3:30. North Attleboro, 2 @ Foxboro, 1 – Final – Riley Collins opened the scoring for Foxboro off an assist by Hailey Maling. Haley Guertin equalized for North before halftime on an assist from Haley Ferrin. Ashlyn Gaulin then scored the game-winner in the second half off an assist from sister Emma Gaulin to give the Rocketeers the two points. North head coach Bill Wallace said Rachel LaBonte, Emily Chiasson and Aine Mendonca played well while Nina Beauvais made a couple of great saves in net. King Philip, 1 @ Franklin, 1 – Final – Rachel Hogan scored the lone goal for the Warriors and Nadia Havens scored for the Panthers on an assist by Calen Frongillo. Mansfield, 1 @ Oliver Ames, 1 – Final – Hannah Reiter scored off a Emily Vigeant free kick early in the second half. Lauren Wright answered for the Tigers off an assist by Emily Freeman. Milford @ Sharon Postponed to 10/28 at 3:45. King Philip, 3 @ Westwood, 0 – Final – King Philip closed the regular season with a sweep on the road, winning 25-18, 25-19, 25-17 to finish the regular season 18-2. Sydney Phillips had 14 kills, Emma Lopez added six kills and Amanda Loewen chipped in with six digs. Oliver Ames, 3 vs. Brockton, 0 – Final – Oliver Ames qualified for the state tournament with a 25-11, 25-21, 25-21 win over the Boxers. Jackie Kandar four kills and two blocks, Bridget McCarthy finished with 27 assists and two aces, Emma Petrillo had a team-high nine kills and three aces and Kayla Raymond (three blocks) and Maya Fetcho (two blocks) had eight kills apiece. Franklin, 0 @ Attleboro, 1 – Final – Attleboro sophomore Will Halben scored in the second half for the lone strike of the game. 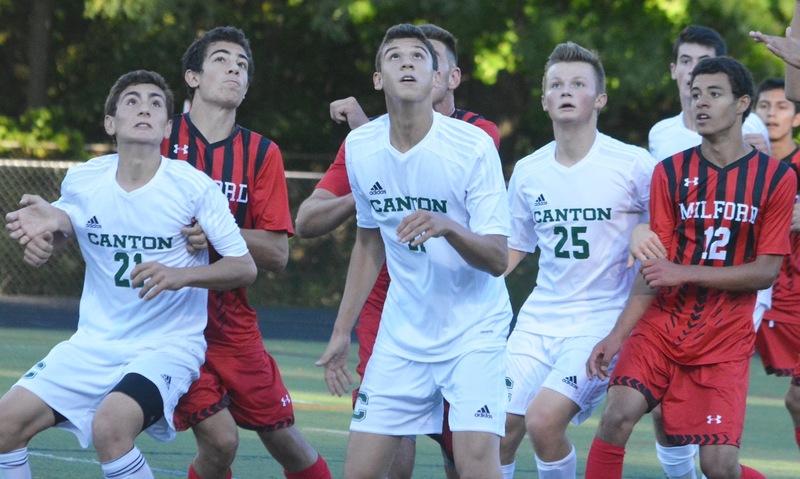 Foxboro, 2 @ Canton, 0 – Final – AJ Bubencik and Shane VandenBoom scored second half goals to give Foxboro its second straight win and third in the last four games. Mansfield, 0 @ King Philip, 2 – Final – Click here for a recap of the game. Milford, 2 @ North Attleboro, 1 – Final – Milford overcame a one goal deficit to grab the two points. North’s Gabe Pinhancos scored what was described as a gorgeous goal to give the Rocketeers the lead. Milford’s Pedro Sampaio tied the game off an assist from Joey Madden early in the second half while Marcello Panno netted the game winning goal off an assist by Tiago Carvalho. Oliver Ames, 2 @ Taunton, 0 – Final – James Gillespie and Thomas McCormick each scored to lead the Tigers to their third straight win. Nathaniel Cardoza had the assist on Gillespie’s goal while Jack Sheldon set up McCormick’s tally. Sharon, 2 @ Stoughton, 0 – Final – Click here for a recap of the game. Attleboro, 0 @ Franklin, 7 – Final – Emily Mastaj and Calen Frongillo each had two goals and an assist for the Panthers. Molly Duncan added a goal and an assist for Franklin, while Nadia Havens and Ellie Teixeira both scored goals. Miranda Smith and Jamie Dragsbaek also had assists. Canton, 2 @ Foxboro, 3 – Final – Kristen Bortolotti scored a pair of goals for the Warriors who rallied from a 2-0 deficit to pick up the win. Kendra Wentling’s first goal of the season was the game-winner and Lily Sykes recorded assists on all three goals. King Philip, 0 @ Mansfield, 2 – Final – Hannah Reiter recorded a goal and an assist, as the Hornets scored twice in the first half to stay within a point of league leading OA. Reiter scrambled home a goal from a corner with Melissa Reef getting the assist and then her shot was saved into the path of Cassidy McMahon who knocked it in for a 2-0 lead. Emily Gaumond made three saves for the Hornets and Emma Durant made seven saves for the Warriors. North Attleboro, 4 @ Milford, 1 – Final – With the win, the Rocketeers clinched the Davenport division title, which is the first in program history. North Attleboro scored once in the first half but added three more in the second stanza. Ashlyn Gaulin opened the scoring for North, converting a pass from Haley Guertin. Emma Gaulin scored the next two goals for Big Red, finishing off passes from Guertin and Emily Scrhomm. Grace McGoldrick capped North’s scoring off an assist from Julia Tolfa. North head coach Bill Wallace said Rachel LaBonte, Emily Chiasson and Sam Hawkins all played great in the back. Maggie Boyle scored the lone goal for Milford on an assist by Julianna France. Milford coach Jay Mastaj said that Nicole Dahlgren played well defensively. Taunton, 0 @ Oliver Ames, 5 – Final – Jackie Mills scored a pair of goals to pace Oliver Ames to a win at home. Jess Mills, Lauren Wright and Claudia Ferrara each added a goal apiece for OA. Stoughton, 0 @ Sharon, 3 – Final – Alex Rabb, Ally Steinberg, and Ally Filipkowski each had a goal and an assist for the Eagles. CANTON, Mass. – In a game that featured aggressive pressing in the midfield and disciplined back lines that maintained their shapes and proved hard to break down, scoring chances were always going to be at a premium. Canton took advantage of a set piece opportunity to take the lead in the first half, as Paolo Ruggeri flicked home a free kick for the lead, and the Bulldogs got a full stretch save from Abe Garber with eight minutes remaining to pull out a 1-0 victory on Saturday evening against Milford at World War II Veterans Memorial Field. The Bulldogs had the game’s first chance in the opening two minutes but Jake Verille‘s shot from distance was deflected and easily held by Milford keeper Danny Zwonik. Five minutes later, Milford had its first shot on goal when Marcello Panno’s header from a corner was tipped over the bar by a back pedaling Garber. In the ninth minute came the break through. Canton had started the game well and pushed the Hawks back, which led to a foul on the left side of the box. Griffin Roach served the ball into the box and it was side footed towards goal by Ruggeri. The ball hit the underside of the bar, landed and then was headed home by Ben Waterhouse, but the official said that the initial shot had crossed the line. “We worked on restarts yesterday, so we’re really happy about that,” said Erickson. The game settled into a midfield stalemate for the majority of the first 40 minutes. Milford absorbed the Canton pressure and kept the Bulldogs from getting the ball into dangerous areas. In the 25th minute, Verille sent in a corner that was met at the far post by Dillon Anderson but his shot was saved by Zwonik. Two minutes later Zwonik got down well to his left to keep a long free kick attempt by Verille from sneaking inside the post. Milford had one great chance with three minutes to halftime. Garber’s mis-hit goal kick surprised his defender Matas Leveckis and allowed Mike Webber to cut in and intercept. The Milford forward pulled his shot just wide of the post. The Hawks started to find more space in the second half with Pedro Sampaio, Tiago Carvalho, and Panno getting on the ball more often and being able to create. Milford also started to find success with diagonal balls towards the fullbacks that got its playmakers in one-on-one situations rather than the crowded midfield. A long throw by Joey Madden in the 47th minute was headed on by Panno but Carvalho nodded his shot wide from the middle of the box. In the 69th minute, Panno again rose above the defense but his headed chance from Sampaio’s corner was easily held by Garber. Canton’s two best chances to that point in the second half had both fallen to Roach but he had sent his shots narrowly past the post with Milford keeper Luke Capobianco at full stretch both times. In the 71st minute, the Bulldogs had another opportunity when left back John Agnitti’s long diagonal found Paul Corcoran on the edge of the box. After a touch to create room, Corcoran’s shot was saved by Capobianco. According to first-year head coach Brian Edwards, Milford’s defensive effort was the perfect response to the six goals that the Hawks gave up to Stoughton on Tuesday. Milford would create its best chance of the game in the 72nd minute. A throw-in on the near sideline (at a spot that was disputed by the Canton bench) found Sampaio, who turned his defender and found room on his left foot at the edge of the box. He unleashed a shot that looked destined for the bottom corner until Garber dove to his left and got a strong hand to turn it around the post. “Great, great save by the keeper,” said Edwards. Canton was able to run out the clock and take home the two points, but the losing coach was pleased with what he saw from his team, particularly in the second half. Canton (2-2) will host Sharon on Monday night, while Milford (1-4) will try to get back on track with the visit of Foxboro. Milford, 2 @ Taunton, 1 – Final – The Scarlet Hawks netted a pair of goals in the first half to earn their first win of the season. Andre Oliveira opened the scoring off an assist from Marcello Panno and then Panno doubled Milford’s lead, scoring off an assist from Joey Madden. Danny Zwonik made three saves in the win. King Philip, 2 @ Canton, 1 – Final – Canton scored an early goal to open the game but King Philip rallied for a pair of goals in the second half to get the win. Tessa Cudmore opened the scoring, giving the Bulldogs a 1-0 lead in the 3rd minute of the game. The Warriors potted a pair of goals in the first 15 minutes of the second half. Senior Corinne Palumbo tied the game in the 48th minute and classmate Rachel Hogan scored the game winning in the 55th minute. Both goals were assisted by freshman Chloe Layne. Mansfield, 4 @ Taunton, 0 – Final – Four different players scored in Mansfield’s road win at Taunton.